Magician Jochem Nooyen began his career as a juggler. Soon he had put together a show, which he presented in the streets of Tilburg and Eindhoven. His colleague Koen van Damme took Jochem under his wing and taught him everything he wanted to learn. And Jochem wanted to learn many things. Jochem wanted to try out everything. Nothing was out of his reach: Stilt walking, balloon moddeling, fire breathing, a bed of nails… In 2001 he won the Grand Prix of Flanders with his act ‘Magier Magusta’. Many magicians are still talking about that act. At the European Championship balloon twisting he won second prize. At the age of 23 he auditioned for the Academy of Drama in Eindhoven. The first two years Jochem worked very hard. He learned the techniques of making theatre and acting. He became very good at it and graduated in 2007. From than on, Jochem has been directing many shows. He has been helping other magicians with their act, and he continues to develop himself and his shows. In 2009, Jochem participated in the new Uri Geller show on SBS6. During his performance on this show, the audience voted him to the semi finals! He had to learn mind magic very quick, because of this. But this beautiful form of magic charmed him. Mentalists like Derren Brown and Banachek inspired Jochem. He will never let go of this kind of magic. 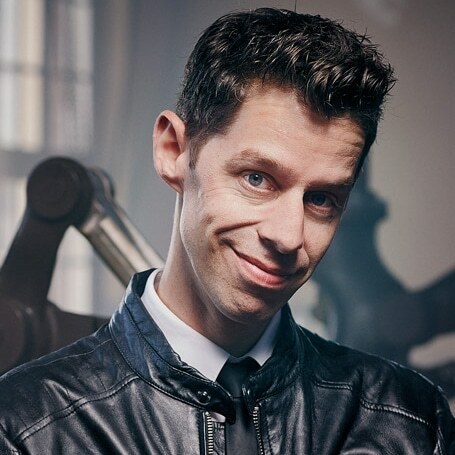 Besides his career as a magician/mentalist, Jochem has become a wanted actor for commercials and short films. He also starred in several successful plays with a foundation called ‘Miracle Maker’. In 2014 he played his first full-length theatre production titled “Traces of an illusionist’. A presentation on what high goals we can reach as human beings when we go for it. Now, his new theatre show ‘influence’ is playing in theatres. Wonder puts people on the edge of their seats. Breaking the ice by letting people laugh. This relaxes the audience. This can be perfectly done with table magic. The party or event always comes at the first place.